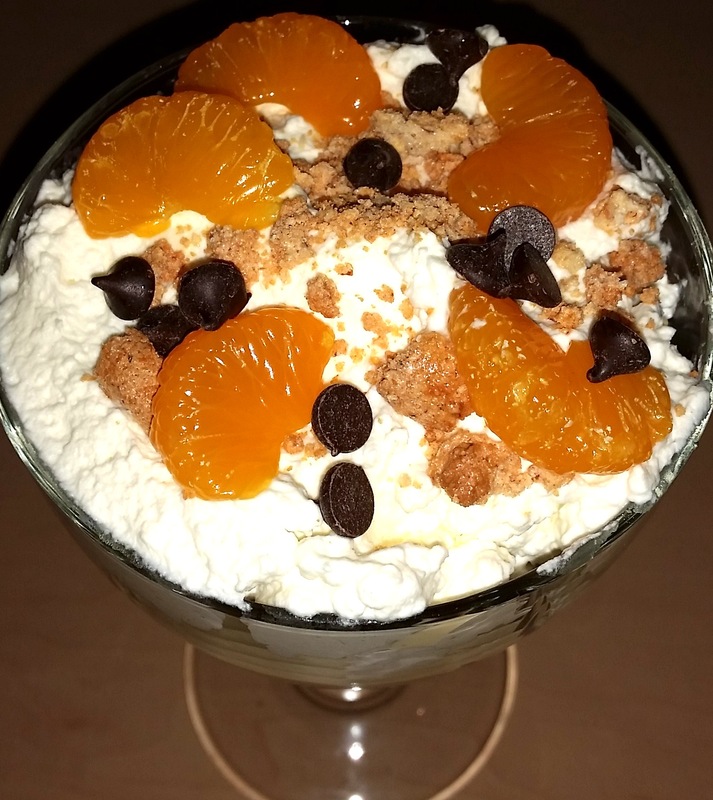 The Twelve Recipes of Christmas continues with our aptly named Opulent Orange Trifle. Andrew: Something nearly as perfect as the pavlova. Andrew: Nothing short and sweet about this trifle, Dawn! Dawn: No jelly and jam, I hope! Andrew: Not a sign! 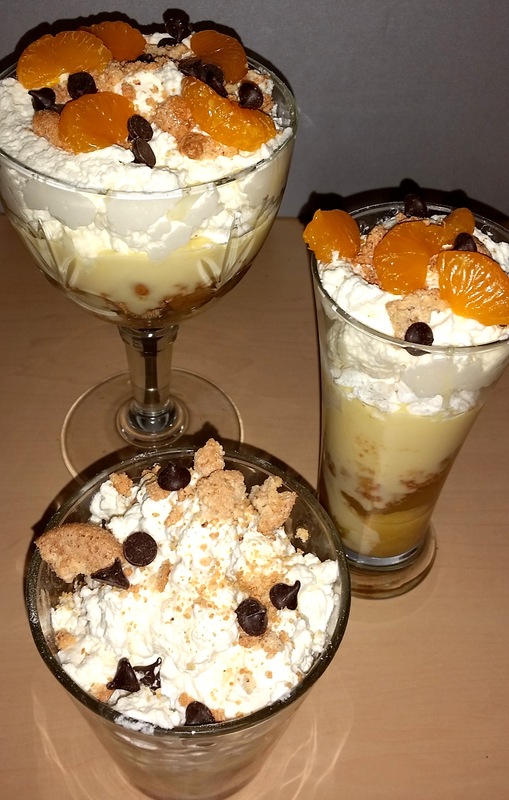 Orange trifle. So luscious a creation that I’ve called it Opulent Orange Trifle. Dawn: Which can be easily converted to a lemon version. See the end of the recipe for how, fellow festive foodies. Slice the trifle sponges in half and arrange at the bottom and sides of a trifle bowl. Alternatively split the ingredients evenly and serve in individual glass bowls or glasses like we have here. Crush half the amaretti biscuits in your hands and scatter to fill any gaps. Drizzle the orange liqueur (or juice) evenly over the slices, then spread the orange curd evenly on top. Break the meringue into pieces and scatter on top of the curd. Spoon the custard evenly over the meringue. Dawn: You can make your own custard by using the recipe within a traditional fruit trifle – Truly Scrumptious Trifle. Alternatively, buy ready made custard if time is restrictive. Andrew: And the meringue nests can be made by using our Magical Meringues recipe. Meanwhile, whip the cream with the vanilla extract and icing sugar until it makes soft peaks. Spread evenly onto the custard. Dress with trifle dressings of your choice. Grated chocolate, almonds, candied lemon or orange zest. We used mini chocolate drops and the remaining amaretti biscuits. Andrew: Do make a lemon version is relatively simple, too. Dawn: And we give you the recipe here. Replace the orange curd with lemon curd. Instead of orange liqueur, use lemon liqueur. For the non-alcoholic version lemon juice diluted and sweetened with sugar or honey is fine. Andrew: A worthy addition to the festive season’s dinner table? Dawn: Indeed it is. 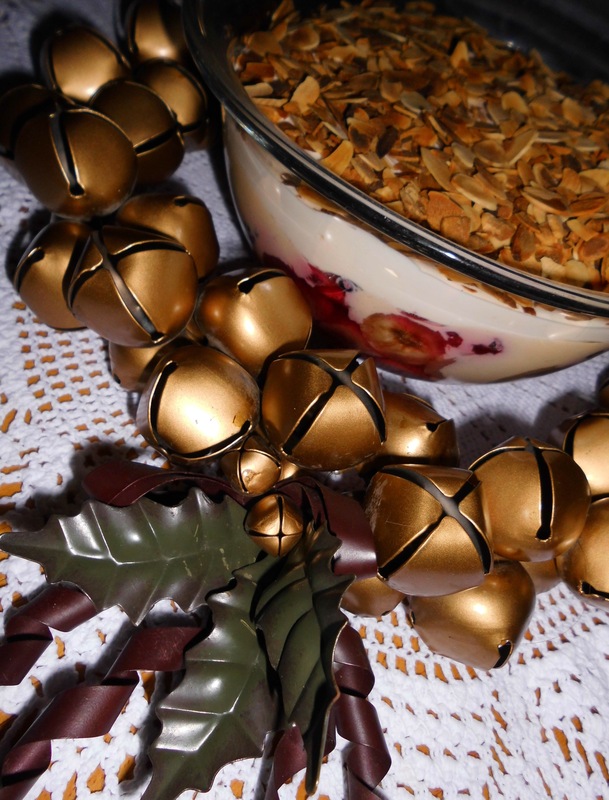 A delicious, indulgent and opulent treat at this very special time of year! Enjoy! And as the classic all-time favourite movie is airing, the one and only, majestic Ian Fleming’s Chitty Chitty Bang Bang, we’re celebrating all that’s delicious, delightful and deliriously decadent with our Truly Scrumptious Trifle! One for festive frolics and a super indulgent pudding for Christmas time and special occasions. Dawn: This is one of my all-time favourites that makes me really think it’s Christmas! Andrew: The ingredients alone are very decadent…how do we start? Taking the trifle sponges, cut each in half, lengthways and spread one side of each with the jam preserve of your choice. Position in the base of a large glass bowl and prick the top of each sponge with a fork. Pour the sherry or Madeira over the sponges, making sure each is covered in the golden looking liquid. Set aside in the fridge while you make the custard to allow the trifle sponges to absorb the liquor. You may wish to prepare these the night before you use to serve the trifle, if you wish. Put the egg yolks, cornflour and castor sugar in a bowl and mix together until they are combined to become a bright, yellow jewel. Put the custard whipping or double cream in a saucepan adding either the vanilla pod which is first cut its length and the seeds scraped out along with the outer pod put into the cream, too or add the tsp of vanilla essence. Gently heat the cream and vanilla mixture on a hob until hot then add to the egg mixture, stirring as you do to combine the ingredients. Now pour the custard ingredients back into the saucepan that you’ve used for heating up the cream and return to the hob. Dawn: You must stir the mixture constantly to avoid any lumps forming if it’s left alone. The custard will start to thicken and when it does, take the saucepan off the hob, remove the vanilla pod if you’re used one and set the custard aside to allow it to go completely cold. Remove the trifle sponges from the fridge which will have absorbed the liquor by now. Peel the bananas, slice and scatter across the trifle sponges. Add the defrosted mixed berries, too. Andrew: Can I use fresh fruit, Dawn? Dawn: Yes, Andrew. I’d look at using any ripe soft berries such as strawberries, raspberries and/or blackberries. If you have them, you can also add red and blackcurrants. With the cream set aside for the fluffy topping, whisk it to a thick consistency with an electric hand mix. Dawn: You’ll know the cream is ready when you can make upright peeks in it. Make sure the custard is cold and pour this over the trifle sponges and berries base. Next, scoop out all the delicious, fluffy cream topping and make sure all the custard is covered. Finish the trifle off by scattering the toasted flaked almonds all over the fluffy topping. Dawn: And hey, presto! Truly Scrumptious Trifle! My favourite! Andrew: It looks too wonderful to tuck into! Did I tell you a man was found in a doorway covered in sponge, fruit, custard and cream! Police are warning that his attackers are not to be trifled with! Andrew: It is! Do carry on! 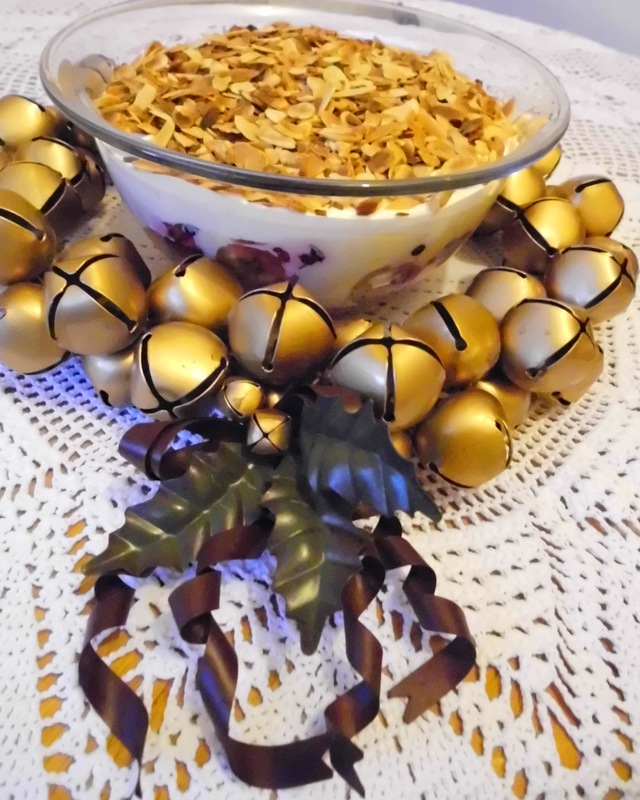 Dawn: Carrying on…it’s a really lovely treat recipe and one I make once, possibly twice a year because it’s so high in sugar! But every mouthwateringly delicious bite is to be savoured and it really, really is Truly Scrumptious! For more delicious delicacies, follow the Cooking Duo’s tips and recipes on this blog and at Twitter @Love_Food_UK. Making a superb alternative ‘afters’ to traditional Christmas pudding, meringue is extremely easy to make and can be made well in advance of the big day. 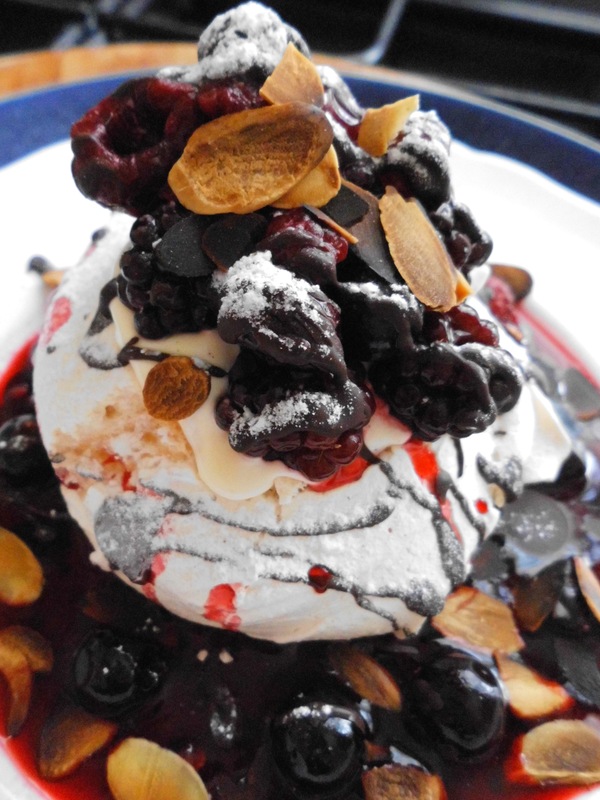 Dawn: Meringues look the most decadent pud when ‘dressed for the occasion’! Andrew: Don’t they just?! And can keep for up to six weeks which is excellent for planning ahead. Preheat the oven to gas mark 1, 140 °C electric. Put the egg whites in a large bowl and whisk with an electric hand whisk or food processor while gradually adding the castor sugar. The egg whites and castor sugar will start to combine to become white, opaque and fluffy. When the mixture is stiff, perky peeks will be formed enabling you can turn the bowl upside down with the mixture remaining inside. Dawn: Now’s the fun part! Scoop the breath-takingly gorgeous mixture out on to a lined ovenproof baking tray. Either mound or nest the meringue mixture into equal sized portions. Place the baking tray in the centre of the preheated oven and cook for about one hour on this gentle heat. Andrew: How will I know when the meringues are cooked, Dawn? Dawn: I go by look: are they golden brown in colour yet? And by touch with a gentle squeeze. If they’re ‘bouncy’ in touch, they’re cooked and ready to cool . Andrew: And you can add a little ‘zing’ to their flavours by slightly sprinkling a little cinnamon or nutmeg on them before cooking. Dawn: Yummy! Yes, either spice will make a tasty alternative flavour, Andrew. Good idea. Once the meringues are cool, they can either be stored in an airtight container and will last for up to six weeks or they can be decorated. Dawn: Decorating! “Deck the halls with boughs of holly, fa la la la la, la la la la!”…but I digress! Yes, time to decorate these shiny, glistening peeks of gooey loveliness. And again, you’re only limited by your imagination in how you do this. Andrew: What have you used here, Dawn? They look fit for a King! Dawn: Why, thank you, Andrew. They do look rather ‘regal’, don’t they? And so easy to do! I’ve lightly crushed the top of each peek and added a tablespoon of the cream, topped with a mixture of raspberries, blackberries, black and redcurrants. Over the top of each meringue, I’ve melted the dark chocolate and drizzled this runny yumminess over each peek and then dusted with icing sugar. The ‘look’ is completed with a smattering of the roasted flaked almonds on each. Andrew: You’ve used dark chocolate but can any chocolate be used? Dawn: I’ve used dark to give a flavour contrast to the sweetness of the meringue, Andrew and yes, any chocolate can be used. It’s really down to individual taste. Place the berries, sugar and water in a saucepan and lightly heat until the berries are soft and the sugar is dissolved. Next, heat the berries until boiling away and the mixture thickens. Now, press the berries through a fine sieve and the remaining pulp can be frozen to use in our Perfect Pancakes‘ recipe. Dawn: When chilled, simply drizzle the coulis around each fruit filled laden peek and hey presto! A beautiful pudding! For more simple and easy to cook at home recipes, follow this blog and our Twitter account for regular updates and cooking tips over @Love_Food_UK.